2017 is around the corner and we’re very excited about it. We’ve seen major and cool WordPress updates, plugin and theme releases in 2016, and WordPress.org has statrted to test out its new directory. It seems pretty good with whiter pace and the reviews, FAQ’s and developers name neatly organized right under the plugin description. Now that we’re about to turn the page for another year and start a new one, I know all the WordPress users, bloggers and enthusiasts are on the lookout for some great products that can be used over the coming year to stay on top. With this in mind I’ve made a roundup of WordPress plugins that are, and will still be on a high demand in 2017. They target a wide range of functionalities, and will bring in a lot of cutting edge features to your blog. Let’s get down to the list. Google Analytics was a major breakthrough for blog and website owners around the world, and it’s still one of the most demanded and widely used analytical tool available. The authenticity of Google analytics is not going anywhere, that’s why Google Analytics WD plugin comes first in the list. It’s the most advanced WordPress Google Analytics plugin available, which gives you access to all GA reports right from your dashboard. It allows you to track every single activity on your website with its custom reporting and goal management functionalities, and lets you exclude data from users, cities, IP addresses and regions that you don’t simply need. You can also enable the tracking of custom dimensions, and link your AdSense, AdWords and Ecommerce accounts to GA to view relevant stats from the plugin’s reporting page without leaving your website. The plugin has a super user-friendly interface and is very easy to use and customize. Organizing and promoting events online is still a widely popular marketing strategy and it seems it will also prevail in 2017. 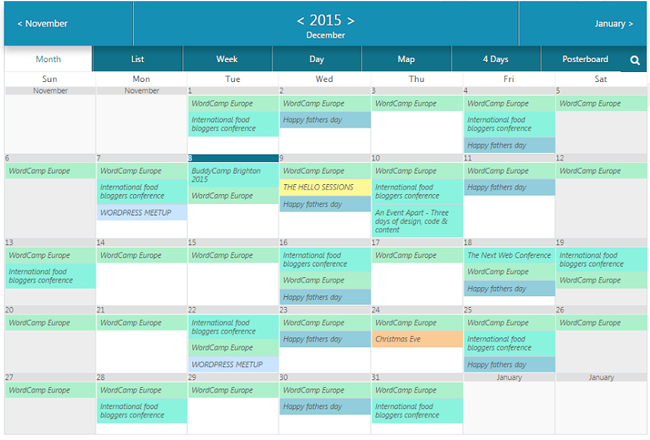 If you display events on your site, make sure to check out Event Calendar WD plugin. Whether you organize a single event per month or multiple events per day, this advanced WordPress event calendar will help you easily create and manage your events. It allows you to provide detailed information to your visitors about each event, including event location, organizers, links etc. Apart from that you can create recurring events by simply choosing its repeat rate and the plugin will automatically add it to the calendar. Event Calendar WD has a number of beautiful view options and 5 customizable themes that make your calendar look outstanding. It supports structured event markup and makes sure your events are listed in relevant search queries in Google. Photos and media content are leaders in content consumption, so a cutting edge photo gallery plugin is still a must have for the upcoming year. 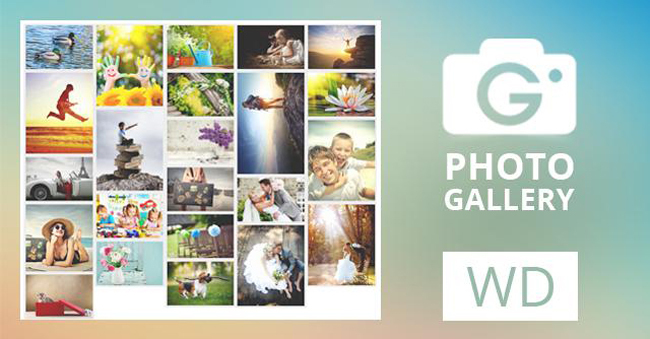 With WordPress Photo Gallery plugin you’ll be able to create beautiful, responsive and fully customizable photo albums and galleries with beautiful views. With the included File Manager you you can easily upload, edit, remove images from the albums/galleries, and provide detailed information for each of them. The plugin comes with 4 widgets, and features a powerful lightbox which supports beautiful transition effects, commenting functionality, social sharing buttons, etc. It’s Masonry, Mosaic and Blog Style views are truly outstanding. Link errors and missing pages are oftentimes annoying for users, so make sure you have all your links and pages fixed. WordPress Redirection plugin does a great job in managing your 301 redirects and keeping track of 404 errors. It will come in handy especially when migrating pages from your old website, or changing the directory of your WordPress installation. The plugin automatically adds 301 redirection when you change the post URL, and gives you redirection stats to let you see how many times, redirections have occurred. Also, you can add redirections manually for your posts or any other files on your site. If you’re planning on rewiring your blog’s marketing strategy in 2017, CoSchedule will help you to do that. It’s an all in one editorial calendar for WordPress websites,which lets you take full control over content marketing and social sharing. You can easily plan your site’s posts, add any kind of media to the calendar, and also share tasks and resources with your team members. The plugin is also perfect for scheduling social media messages and tracking social traffic. Its powerful functionality allows it to promote your content at the best possible time when your targeted niche is most active. ThemeCheck is a rapidly growing WordPress plugin, which will help you to check your current theme for the latest WordPress theme review standards. It runs the same checking tools which WordPress uses for theme submissions. The plugin tests your theme for the latest standards and displays the results immediately. It’s distinguished with its simple interface and ease of use. Jetpack is a powerful WordPress plugin that makes site management easy and gives you tools to increase your traffic, speed up your website,and protect it from hackings and attacks. The plugin features other useful functionalities such as custom CSS,contact form,notifications and subscriptions, related posts, etc. It automatically optimizes images on in your posts and make them load a lot faster. The best thing about it, is that you manage all the tools through a centralized dashboard. This list contains some of the most widely used and popular WordPress plugins, that will be a great addition to your website in 2017. If your WordPress blog or site misses any of these functionalities feel free to take your pick from the list. I think need to adding plugin cache ?